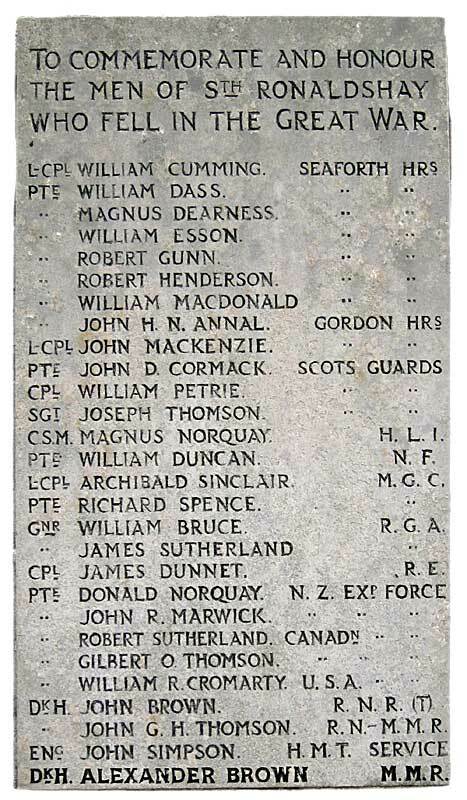 I have a large collection of War Memorial images, both in the UK and abroad and this section is due to be revamped with memorials listed in their respective regional locations etc* This page covers War Memorials in the Orkney only as I`ve yet to visit Shetland. 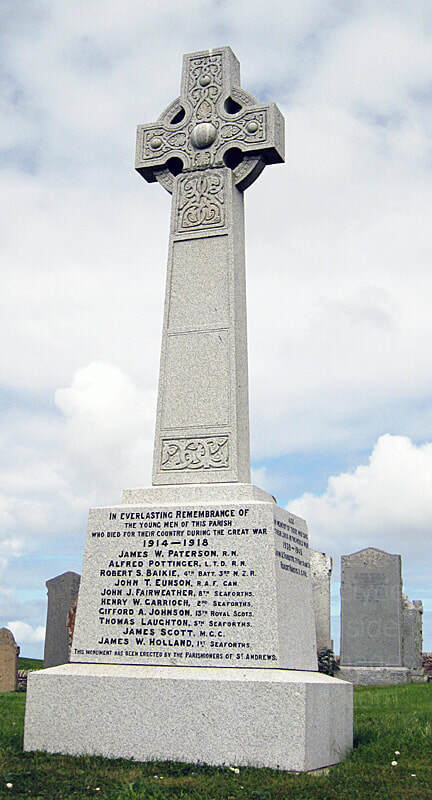 This is the Birsay War Memorial which sits within a graveyard beside the minor B9056 road, west of the A967, on the north-west corner of Orkney Mainland. The Brough of Birsay, a tidal island accessible by a causeway at low tide, lies just to the north. 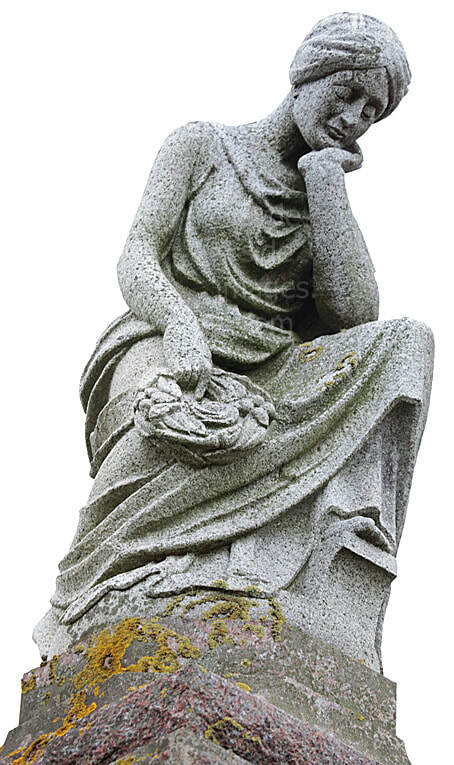 The cost of this memorial was borne by subscription and, somewhat unusually, the Great War casualties are listed under the year that they died, namely 1916, 1917 and 1918. It may be that many of the local men were in reserved occupations such as farming or fishing at the beginning of the war or served within local territorial battalions until mounting losses forced their transfer to active service. 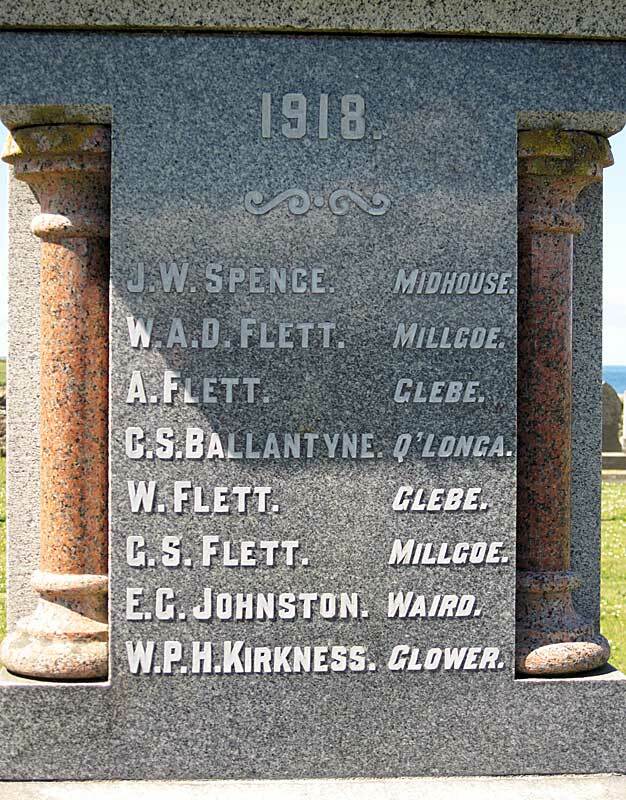 Like many Great War memorials, the one at Birsay records the date of the conflict as 1914 -1919. This is because although hostilities ceased in 1918 when Armistice was declared, technically the war was not over until the following year when the Germans officially surrendered on 28 June 1919 and signed the Treaty of Versailles. 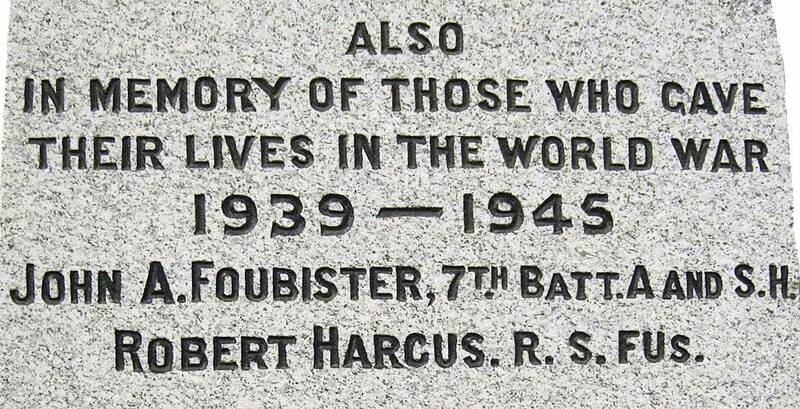 A small tablet bears the names of three local men and one woman who died serving their country during World War 2. 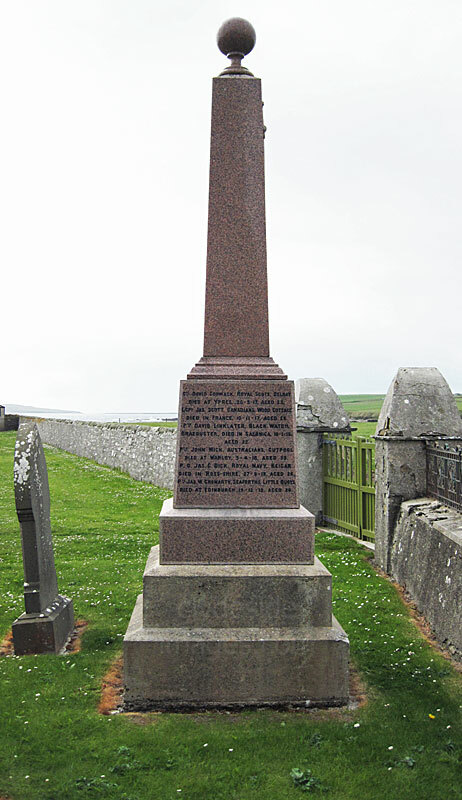 The Deerness War Memorial lies within the graveyard at St Ninian`s Church which is located on the coast, next to Skaill Farm at the end of the B9050, close to the Mull Head Nature Reserve. 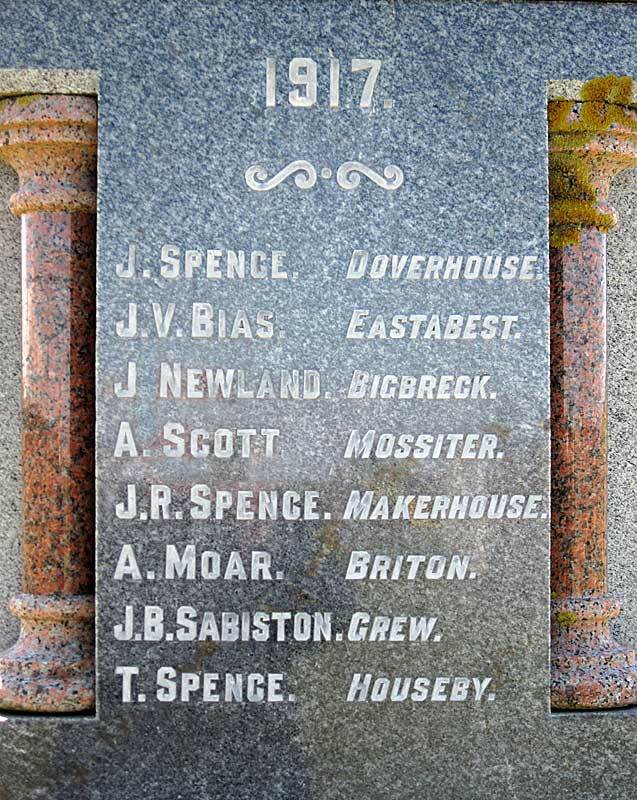 The memorial lists thirteen men out of a local population then recorded as 642, who died in military service during the Great War. 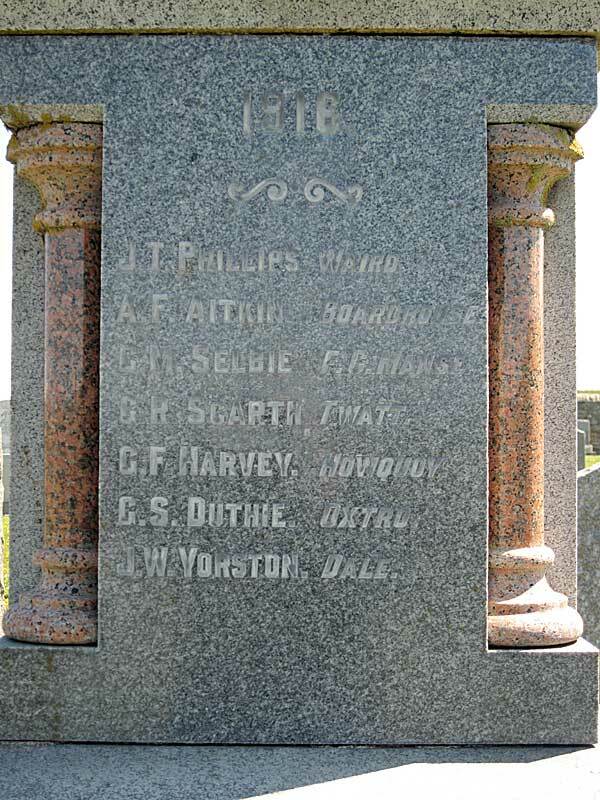 The side panels, in addition to the names of the casualties, list their regiment, place, date of death and age at that time. It appears that the small parish was fortunate to suffer no military fatalities during World War 2. This cross-shaped headstone with an embossed sword commemorates William Young, a serviceman of the Royal Field Artillery who died in 1923. There is also an unusual Norse hogs-back grave marker within the windswept kirkyard. 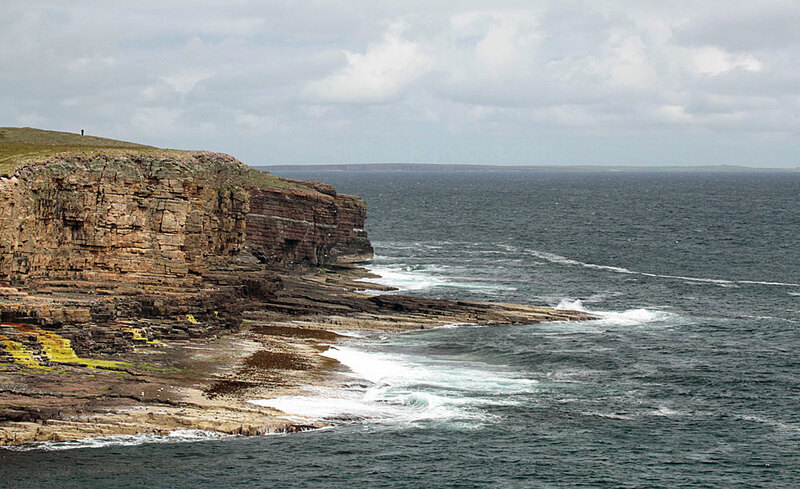 ​At the tip of Deerness the wild and exposed headland of Mull Head has been designated a Local Nature Reserve. 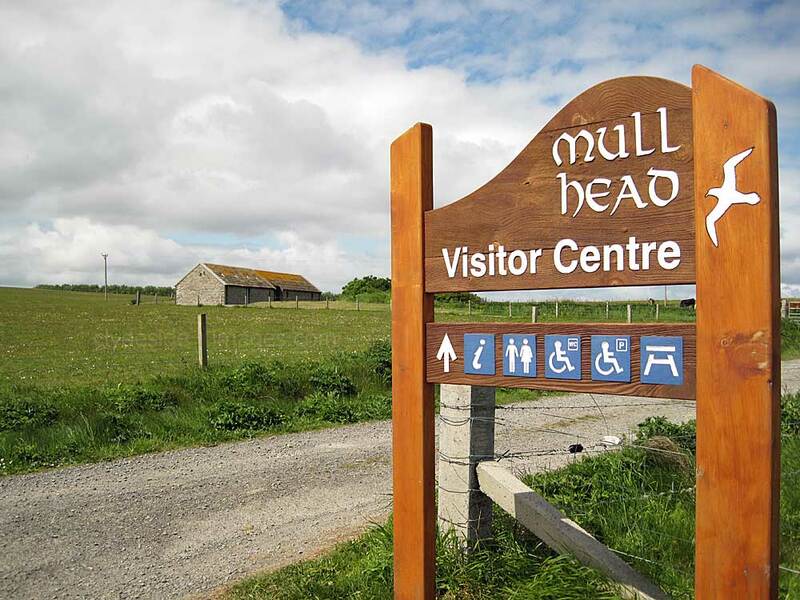 The small well-kept, but unstaffed Visitor Centre has toilets, a hands-on nature display and photographs of Orkney`s scenery and wildlife. ​Easily accessible from the car park is the Deerness Gloup, a spectacular geological feature created by the relentless power of the sea. In the above view two people standing just below the fence-line, to the left of the parked cars, help to give a sense of scale. The visitor centre is on the far right. 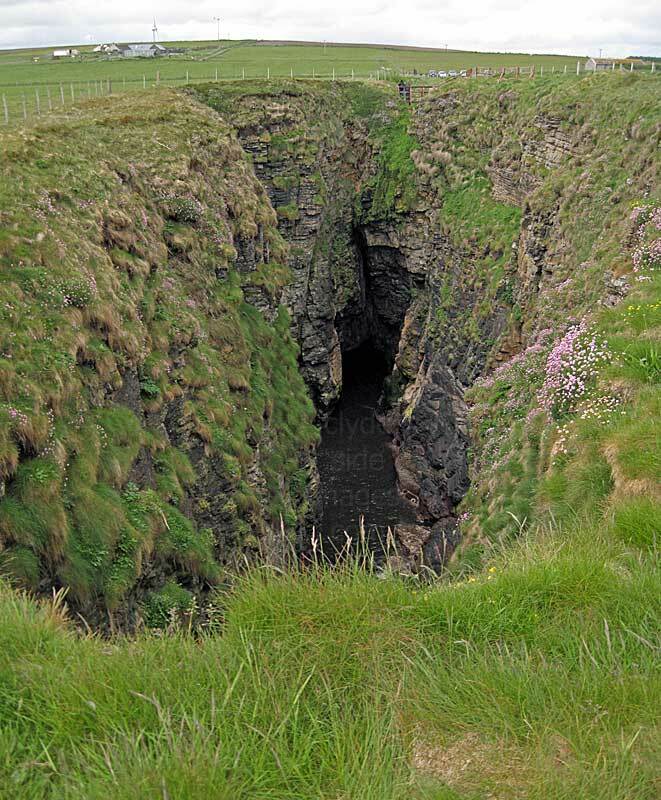 ​The roof of a long sea cave has collapsed just inland from it`s entrance leaving a deep chasm with sheer sides. Occasionally sea kayaks or small boats venture into the Gloup although there was no such activity when I visited. ​From the Gloup a coastal path leads northward to the Head itself passing some superb scenery on the way. The narrow ledges on the cliffs make ideal nesting sites for seabirds although like most places in Scotland the numbers of breeding species have drastically declined in recent years. 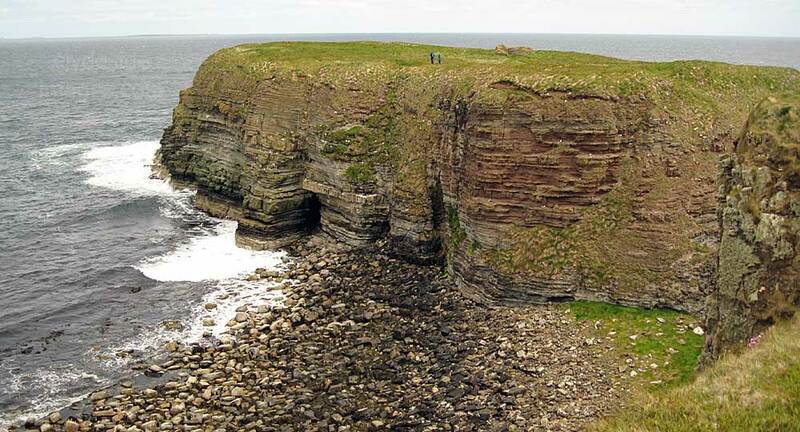 The Brough of Deerness (above) becomes almost cut off from the mainland at high tide. It was once connected by a land bridge but this had crumbled away, possibly centuries before the site was occupied. 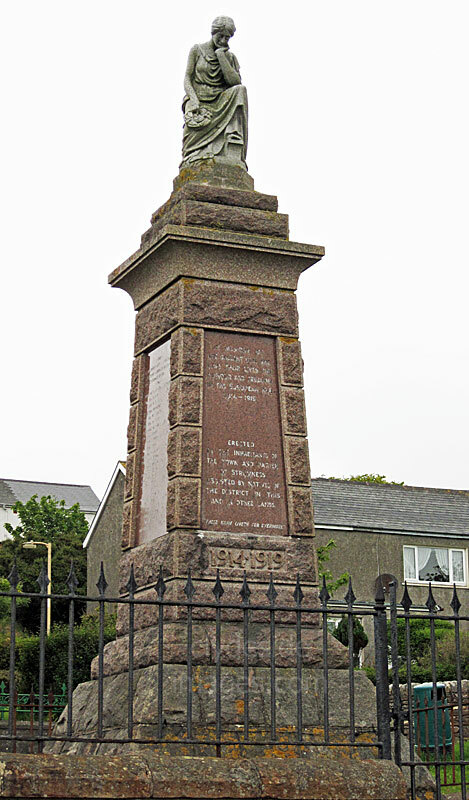 The Holm War Memorial sits in an elevated position beside a right-hand bend on the B9052 road at Crearhowe on Orkney Mainland. 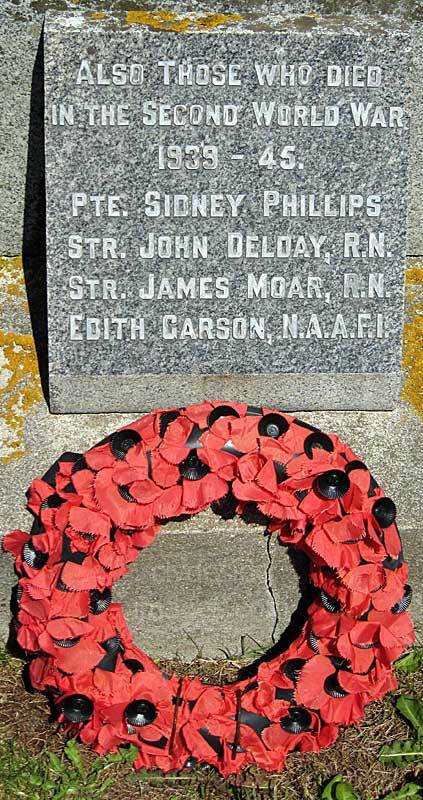 It commemorates the men from St Mary`s and nearby island communities who fell in the Great War. Plaques were added on either side of the steps listing six local men who died during the Second World War. 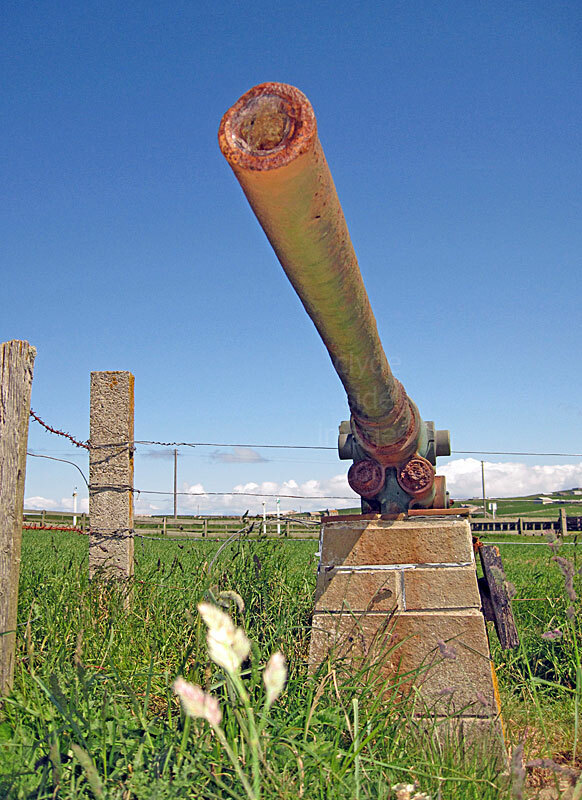 ​The Kitchener Memorial stands close to the cliff edge at Marwick Head on Orkney West Mainland. 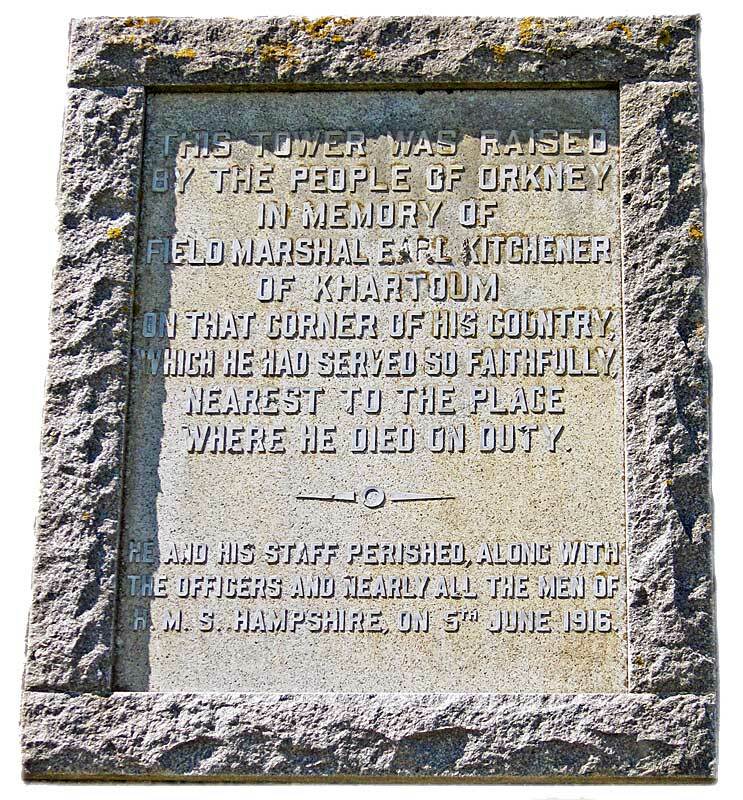 It was erected by public subscription to honour Field Marshall Lord Kitchener and was unveiled in June 1926, ten years after his death. 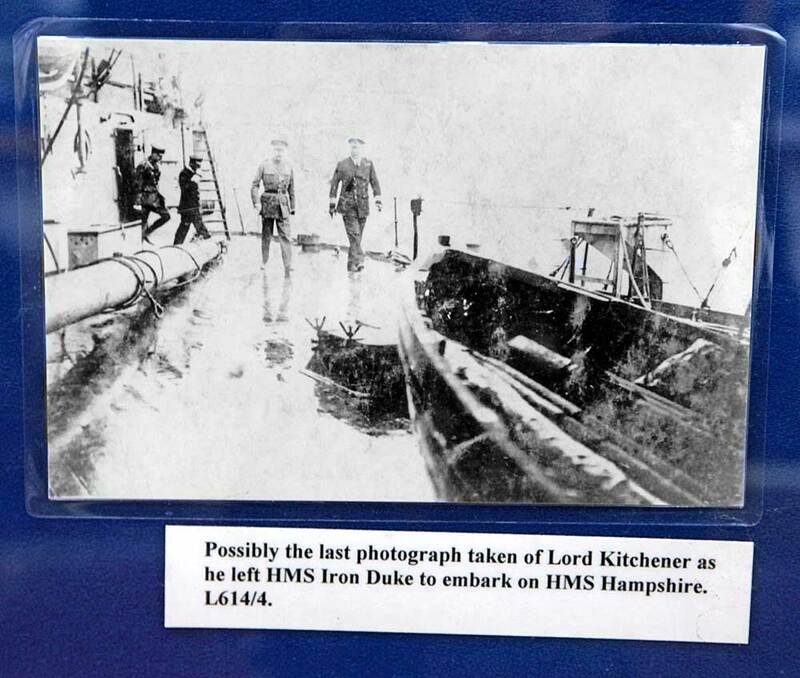 He was lost along with 643 of HMS Hampshire`s compliment of 655 officers and men when the Royal Navy warship struck a mine and sank near this spot on 5 June 1916. HMS Hampshire was a Devonshire-class Armoured Cruiser, built at the Chatham Dockyard in Kent and launched there in 1905. 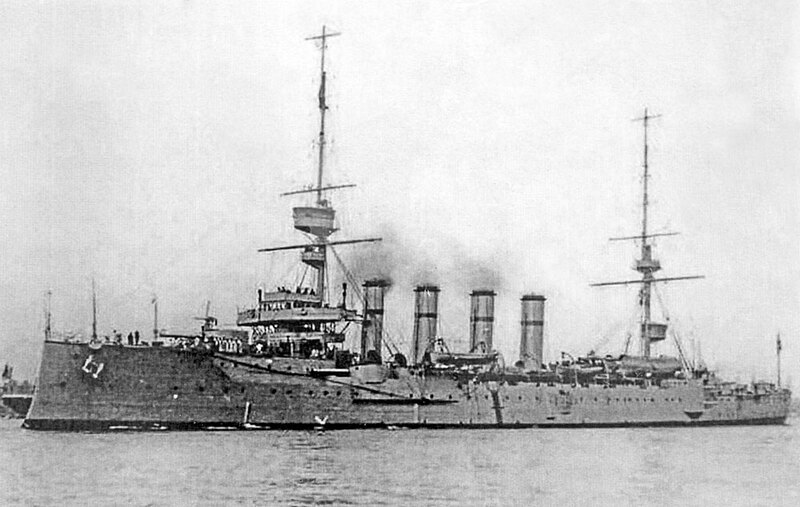 The heavily armed warship had a top speed of 22 knots and saw action early in the Great War and also participated in the Battle of Jutland. 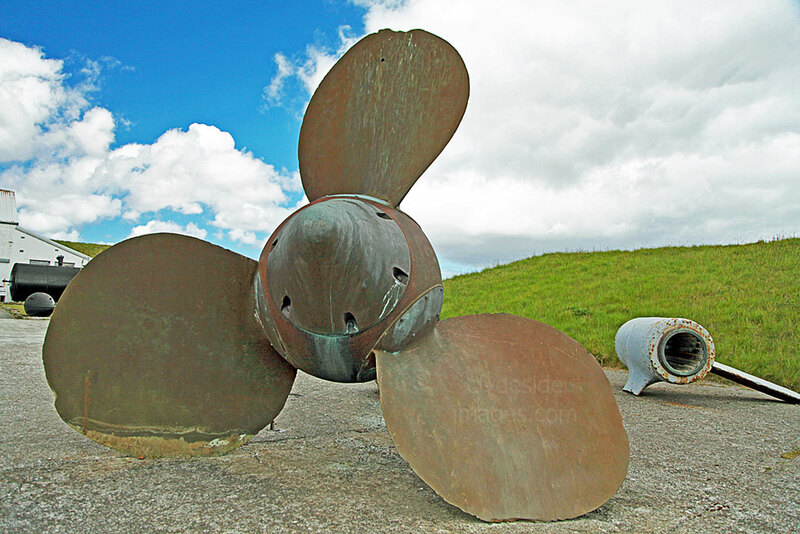 This photo is displayed on an information panel at the Scapa Flow Visitor Centre and Museum at Lyness on Hoy, beside a massive propeller and shaft recovered from the wreck. 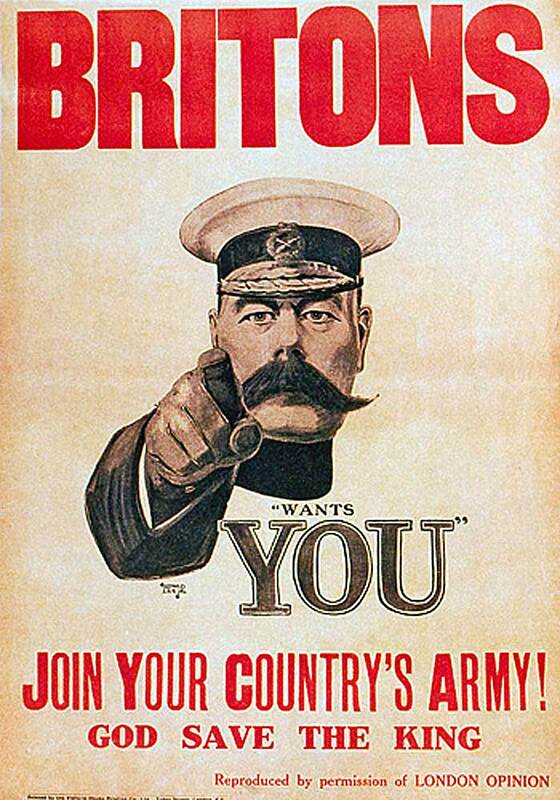 Horatio Herbert Kitchener already had a distinguished military career and due to his past exploits, particularly in the Sudan, he was regarded as a National Hero. Now Minister for War, he was sailing to Archangel in Russia on the Hampshire to meet the Tzar as a matter of urgency. Rising political tension within Russia greatly concerned the Western Allies because, if Russia withdrew from the War, millions of German troops could relocate from the Eastern Front and join their comrades fighting in France and Belgium. Kitchener`s mission therefore was not only of paramount importance but also top secret. By the time HMS Hampshire set sail, a storm was raging. She only made it as far as Marwick Head before she struck a mine, one of a chain laid by German submarine U-75. The warship went down in just 15 minutes. ​In these shots* a small boat can just be seen, far out on the water, close to where the warship went down. 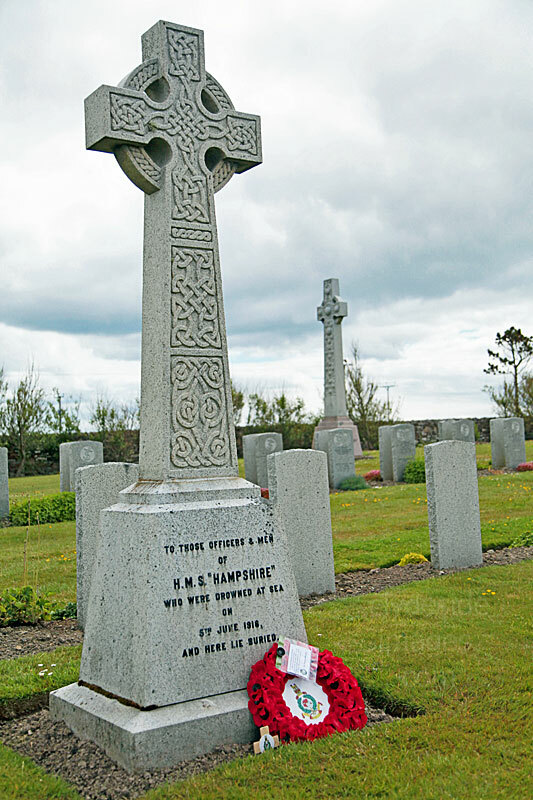 This memorial cross to the men lost when the Hampshire went down stands within the Lyness Naval Cemetery on Hoy. Although within sight of the shore, mountainous seas took their toll of those who had survived the initial blast. Locals, on hearing of the disaster, immediately made their way to the nearest stretches of accessible coastline to render assistance to the few men who had made it ashore, however, the military authorities were quickly on the scene. They barred any further civilian involvement in the rescue operation and sealed off the area. Kitchener`s body was never recovered and this and the circumstances of the sinking have given rise to numerous conspiracy theories. 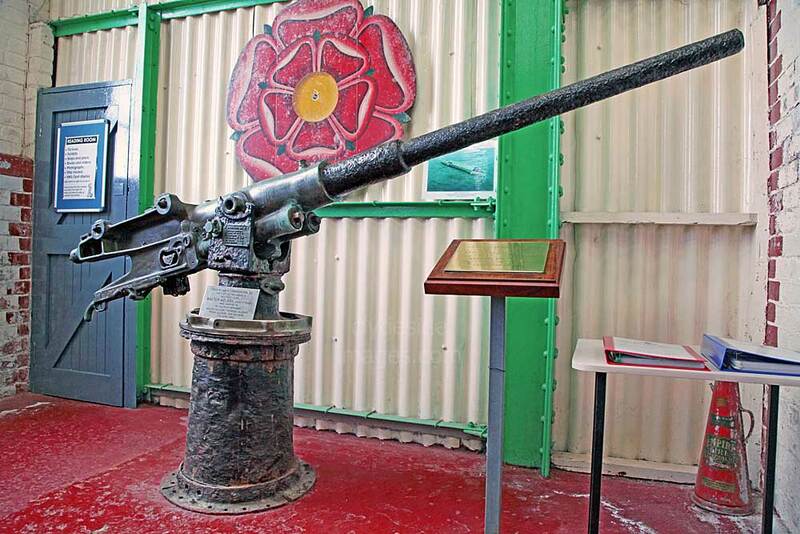 ​A Vickers pattern 31b Recoil MK2 gun was illegally removed by divers from the wreck of HMS Hampshire and following recovery, was placed in the RSPB Reserve car park at Marwick Head to acts as an additional reminder of the tragedy. 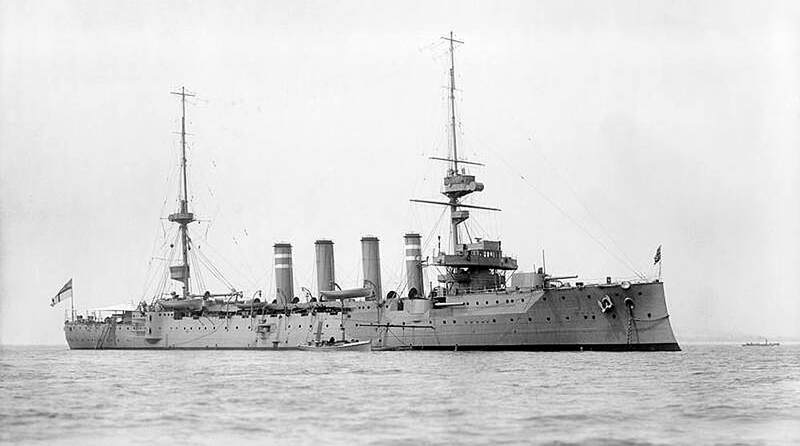 Numerous `souvenirs` were removed from the wreck of HMS Hampshire by divers before it was declared a war grave. Some of these items are on display at the Scapa Flow Museum including this steering wheel and propeller shaft* from one of Hampshire`s steam pinnaces. 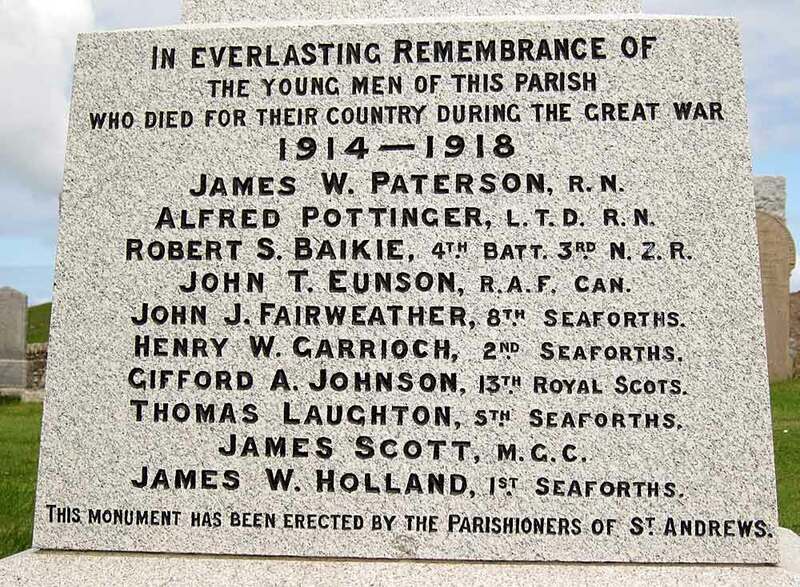 This memorial plaque can be found within the museum at Lyness. This deck gun was also recovered from the wreck and an additional memorial plaque, added in 1990, commemorates Walter Welsby, a 17 year old Boy First Class, lost in the disaster. The manufacturer`s plate shows this Vickers MKII was made at Portsmouth in 1906. The Stromness Museum also has a display relating to Kitchener and the loss of HMS Hampshire. The commander was held in high esteem by the British public and various commemorative items were produced after his death. 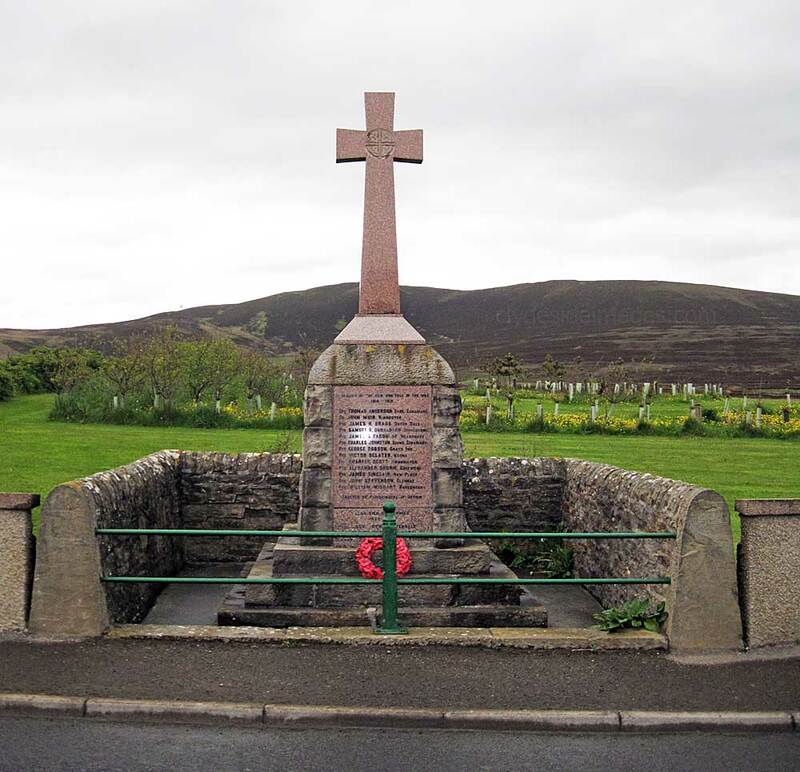 This is the Orphir War Memorial which is situated in the centre of the village, on the north side of the A964 overlooking Scapa Flow near the Houton to Hoy ferry terminal, West Mainland, Most of the First World War casualties recorded on the memorial served in the Seaforth Highlanders. The lower panel lists the local servicemen who died in World War II. 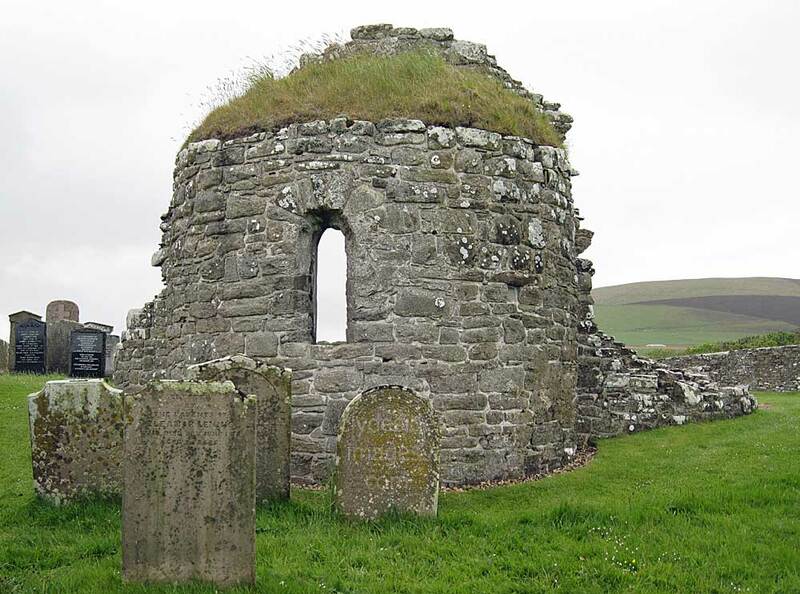 Orphir is best known for The Orkneyinga Saga Centre which was built to tell the story of the Norse Earl`s of Orkney using an audiovisual display. (Check the Internet for opening times). Orkneyinga is thought to have been written in Iceland around 1200, although some of the content clearly refers to a much earlier period. The saga deals with the history of Orkney and Caithness from the 9th to the 12th centuries and although the earliest parts of the narrative contain mythical characters and fictional or exaggerated recollections of events, from 1100 onward the saga becomes more credible and historically accurate. Just behind the centre are a round church and the scant remains of Norse buildings including the Earl`s Bu or manor house which dates from the 12th century and features prominently in the saga as do several of it`s occupants. 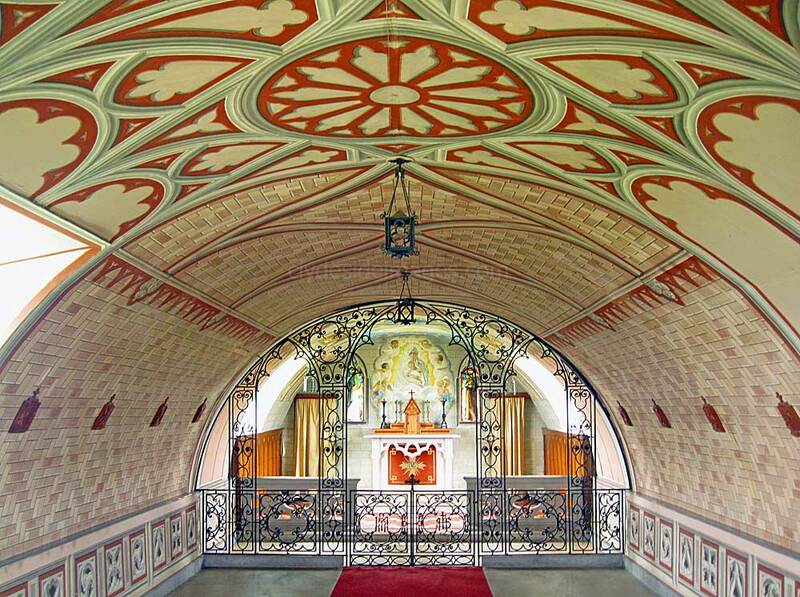 The adjacent Church of St Nicholas was built around 1123 and it`s design is thought to have been based on that of the Church of the Holy Sepulchre in Jerusalem. 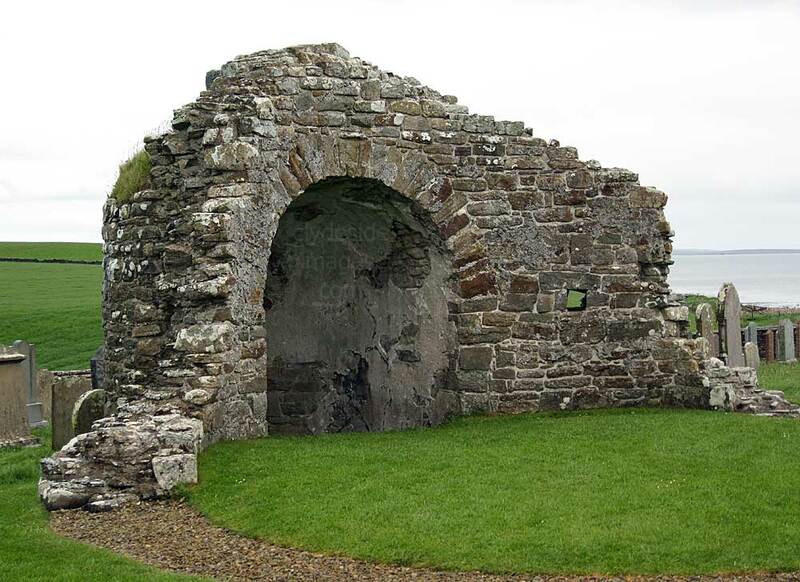 Most of the stone from St Nicholas Church was plundered and used in the construction of the new Orphir Parish Church which was completed in 1757. Only the semi-circular apse remains relatively intact. The Orkney Mainland is divided between Kirkwall and Scapa Flow into two sectors, East and West Mainland. The East Mainland contains the parishes of Holm (pronounced `Ham` locally), St Andrews and Deerness. 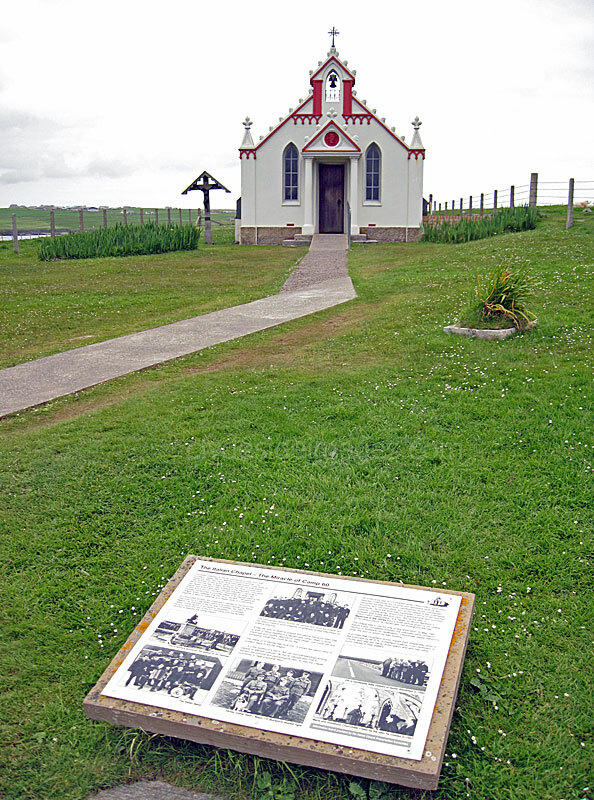 St Andrews comprises two districts, namely Tankerness and Toab, whilst Holm also incorporates the small of island of Lamb Holm, famous for its WW2 Chapel built by Italian Prisoners of War (POWs). 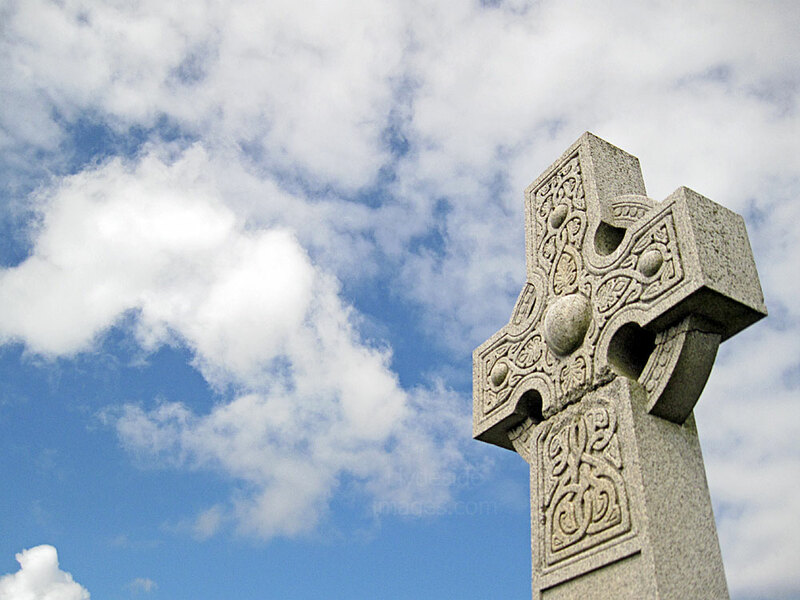 ​The St Andrews War Memorial, in the form of a Celtic cross, stands in a cemetery in Churchyard Road which runs north off the A960, just over 2km east of Kirkwall Airport. The names of those who fell in the Great War are inscribed on the front of the base with those from the Second World War on the rear. 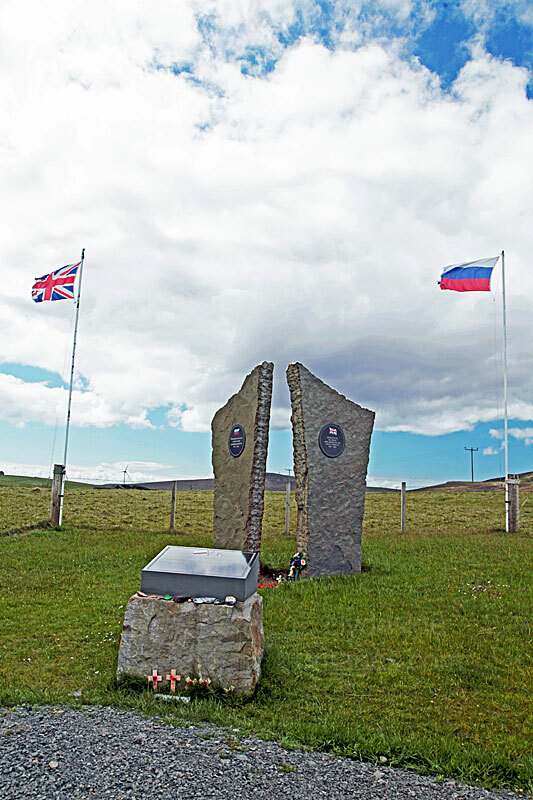 This memorial, mounted on a stone plinth, stands beside the A960 Kirkwall to Deerness road on Orkney Mainland on the site of Orkney`s original aerodrome. The new airport can be seen in the distance in the shot below. * The memorial marks the first British scheduled internal airmail service. The aircraft was a General Aircraft Monospar of Highland Airways piloted by Captain Ted Fresson who took off from Inverness Airport on 8 May 1933 and landed here at Wideford Farm. The modern day Kirkwall Airport sits in a fine situation closer to the sea. It was commissioned in 1940 as RAF Grimsetter following the increased Luftwaffe threat against Scapa Flow after the capture of Norway put the Royal Navy`s Home Fleet within range of Luftwaffe bombers. The Royal Navy Air Service took over the airfield in 1943 and it became RNAS Kirkwall, then HMS Robin, before it passed to civilian operators in 1948. During WWII the Navy`s Barracuda torpedo bombers flew missions from Kirkwall, carrying out sweeps of the Norwegian Coast in 1944/45. 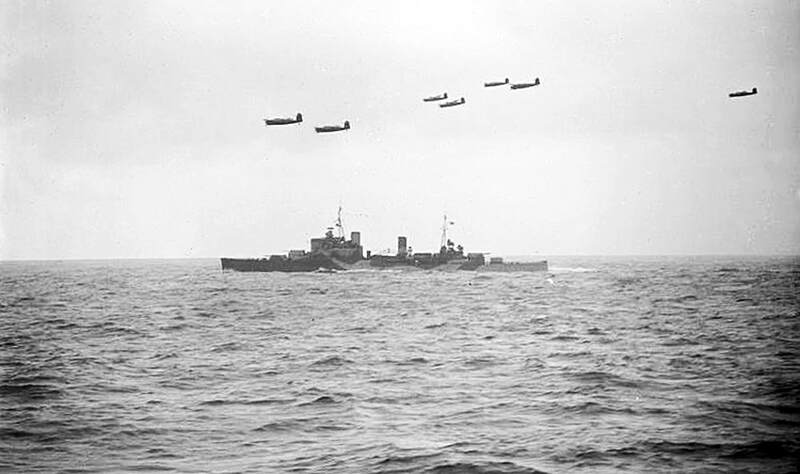 The shot above right* shows Barracuda aircraft, possibly from Kirkwall or RNAS Donibristle, protecting the cruiser HMS Nigeria during a mission off Norway. 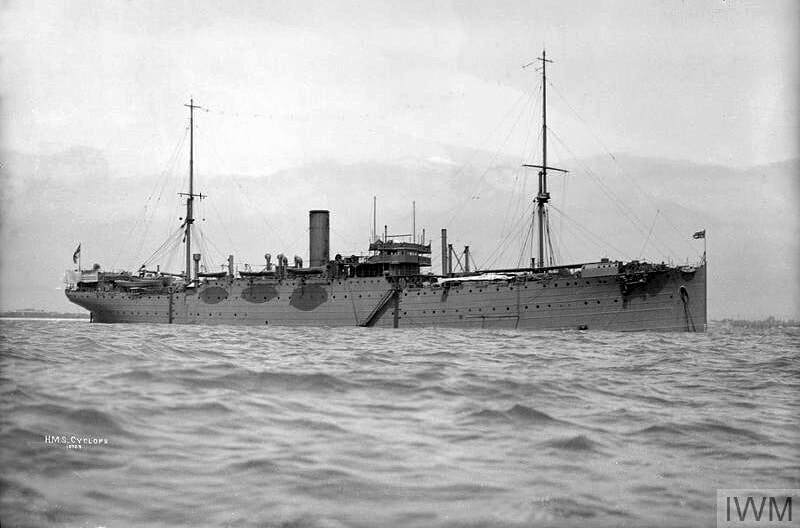 The unidentified photographer was on board the destroyer HMS Impulsive. The main road climbs past the eastern perimeter opening up a tremendous view straight down the main runway. Apart from a couple of static light aircraft there was no sign of activity but by the time I`d stopped to photograph the memorial, this Flybe / Loganair prop was lining up for take-off but I had to settle for a side-on view. 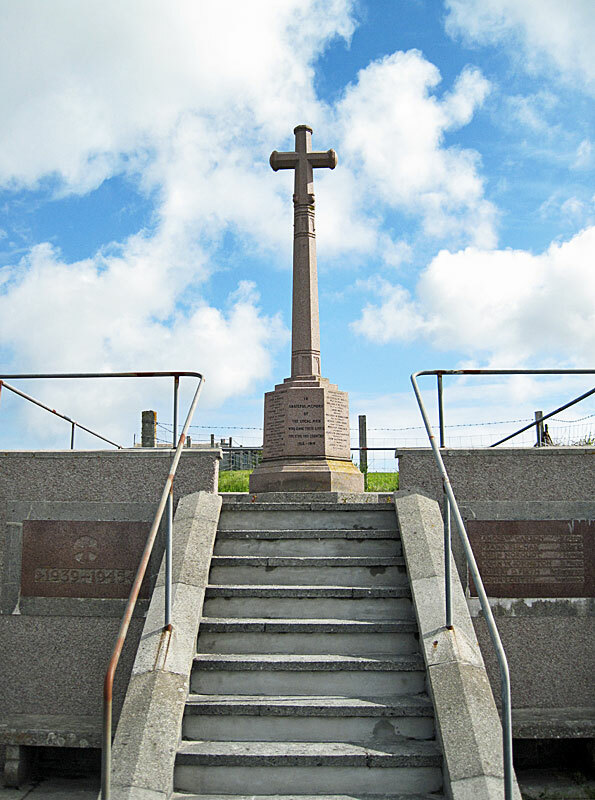 ​The South Ronaldsay War Memorial stands in a prominent position beside the main road above St Margaret`s Hope. 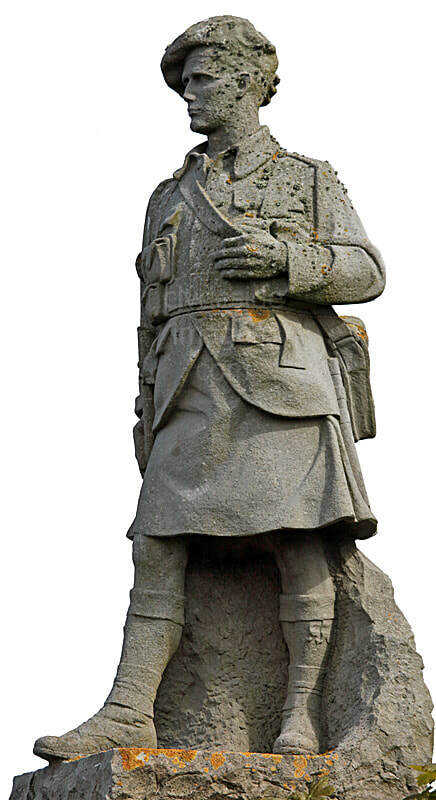 ​The figure of the kilted Highlander was sculpted by Alexander Carrick. 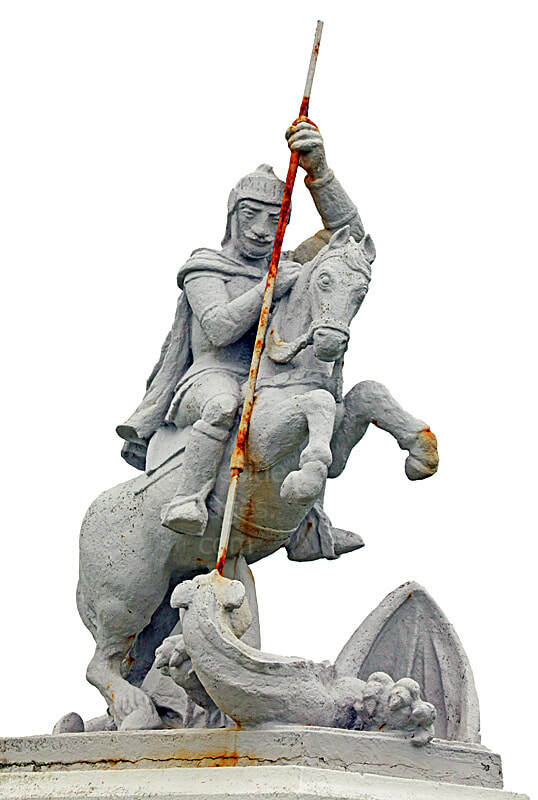 Carrick was one of Scotland’s greatest ever monumental sculptors and was responsible for numerous war memorials, not only in the UK but also overseas. Unlike most other sculptors, Carrick actually served during the Great War, as an artilleryman on the Western Front, and witnessed the horrors of life and death in the trenches first hand. 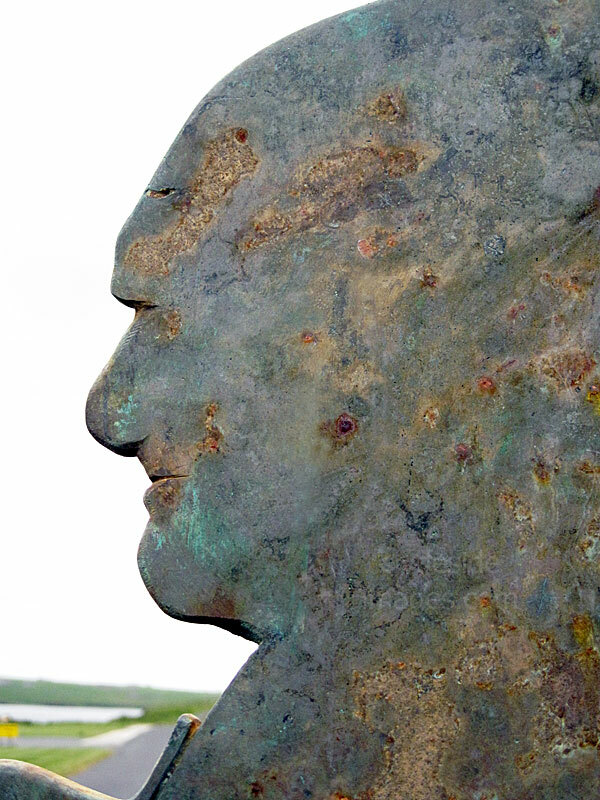 ​A wealth of information on his career and other work can be found on this dedicated website: www.alexandercarricksculptor.co.uk. 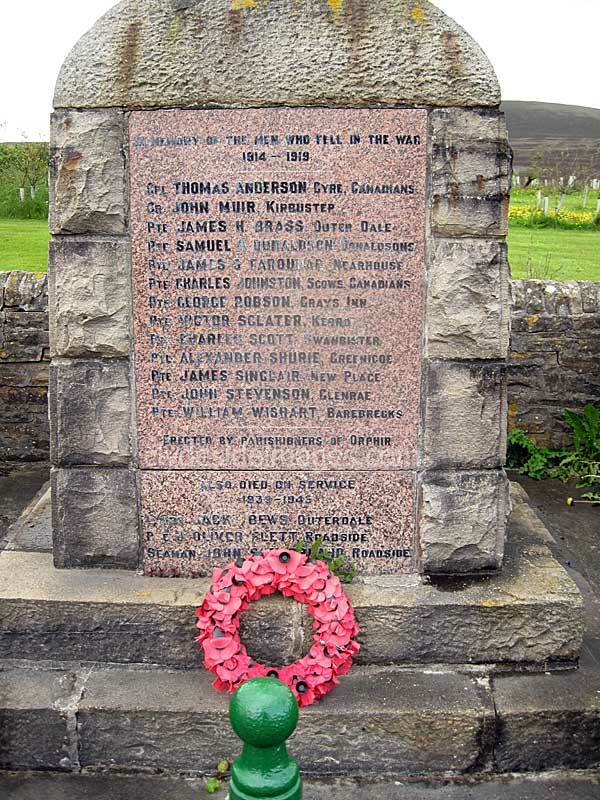 ​Like the majority of the UK`s war memorials, an additional panel was added to South Ronaldsay`s after the end of the Second World War to honour the local military personnel who died in that conflict. 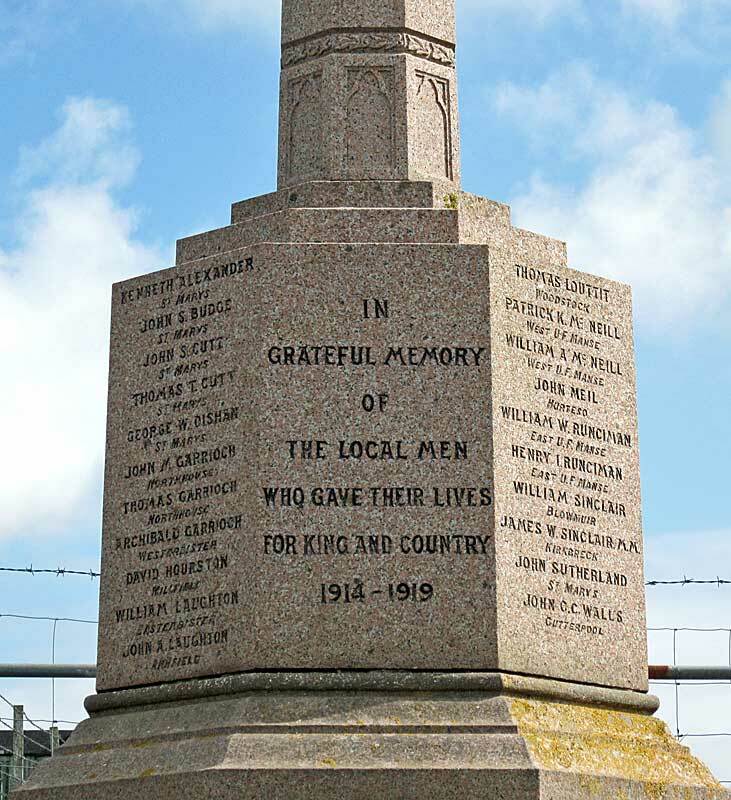 This war memorial sits in an elevated position overlooking Stromness and its harbour and honours local men who died in both World Wars. 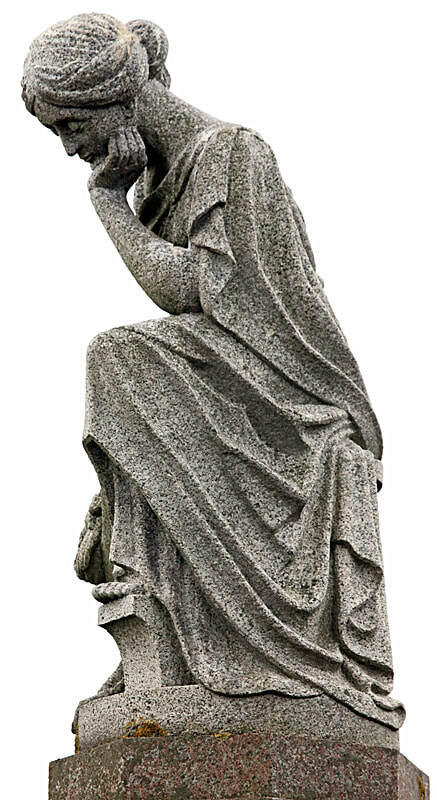 The figure apparently depicts a grieving mother holding the laurel wreath of Victory. 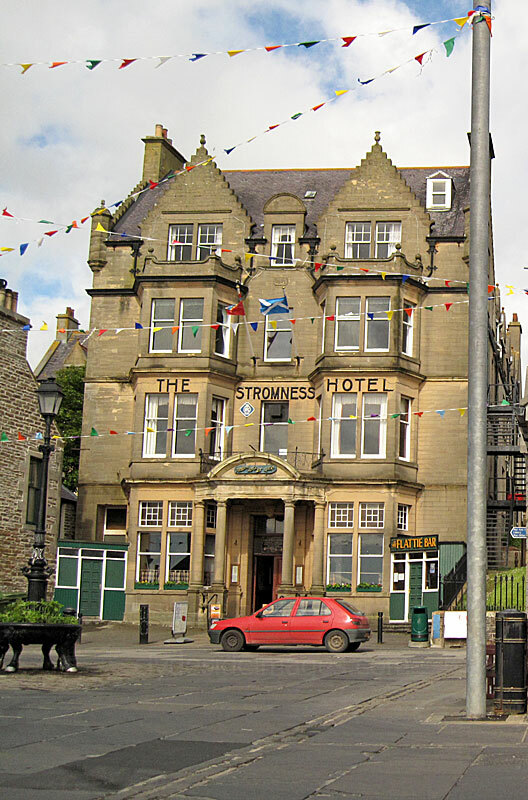 The second part of the faded inscription on the front panel reads "Erected by the inhabitants of the Town and Parish of Stromness assisted by natives of the District in this and other lands." The side panels listing the names of the Fallen are very weathered, unsurprising considering the memorial exposed location, and consequently some of the text is difficult to read. During the Second World War large numbers of Italian Prisoners of War (POWs) were held on Orkney with a large camp, designated Camp 60, on Lamb Holm, a small island just south of the East Mainland. This camp was constructed during the latter half of 1941. 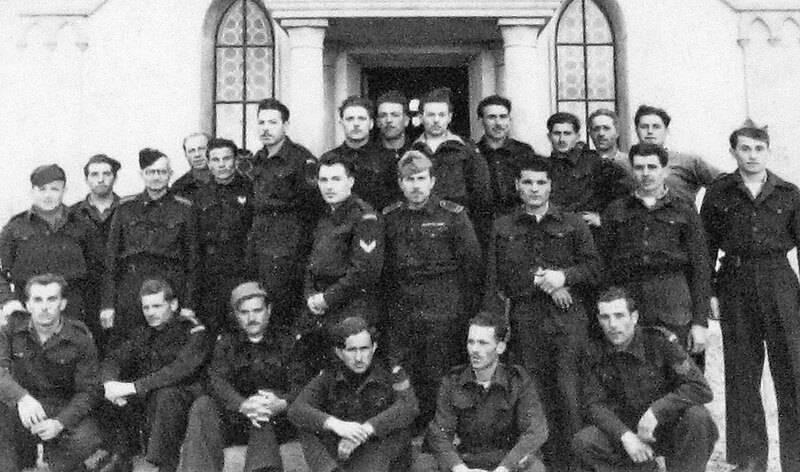 From January 1942, until the spring of 1945, the camp housed Italian POWs of the 6th Anti-aircraft Regiment of the Mantova Division and men from the Italian Tank Corps, most of whom were captured at Tobruk or Benghazi in the Western Desert of North Africa. Following the sinking of HMS Royal Oak in Scapa Flow in October 1939 by a German U-Boat, the British Prime Minister, Winston Churchill, had decreed that urgent steps be taken to bolster defences around the Home Fleet`s main base and reduce the possibility of another similar attack. At that time numerous vessels, known as `block ships` had been sunk in the shallow channels but these were clearly insufficient to thwart a determined attack. The response to the Prime Minister`s and Admiralty`s concerns was the construction of substantial concrete causeways which became known as the Churchill Barriers. The intention was to permanently connect several of the smaller islands in an attempt to limit the approaches available to enemy attackers, both on or below the surface. 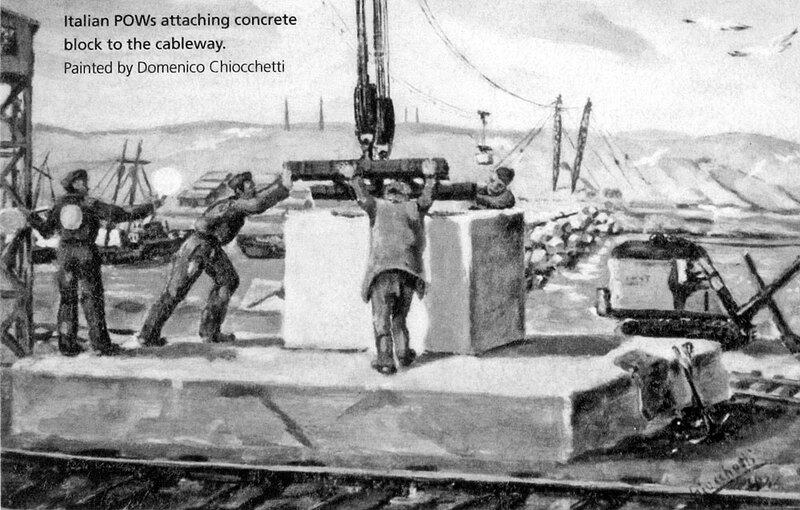 The Italians were put to work assisting the civilian contractors and engineers. POWs from other large camps at Lambholm and Burray also laboured on the project. Eventually the prisoners petitioned the camp commandant, Major Buckland, for a proper place of worship and two Nissen huts were made available. 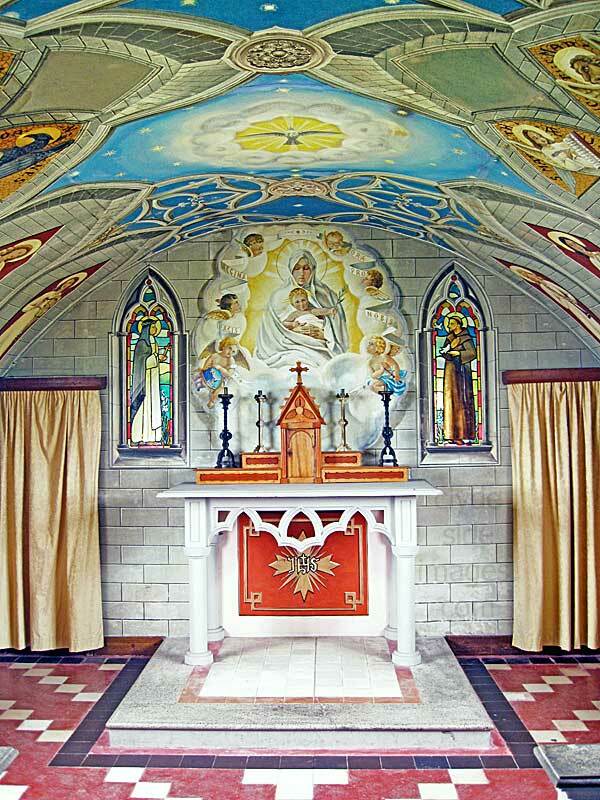 They were placed end to end, with one initially intended to serve as the church and the other a school. 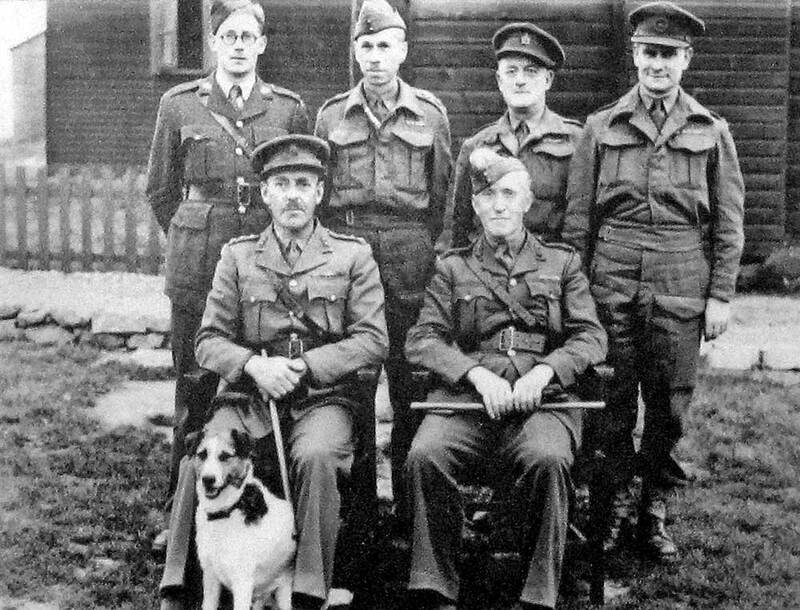 Nowadays, there are information boards on the site which include a plan of the island during wartime and various images, including this one, showing the senior officers who ran the POW camp and supervised the construction project. Major T.P. Buckland is seated on the right. 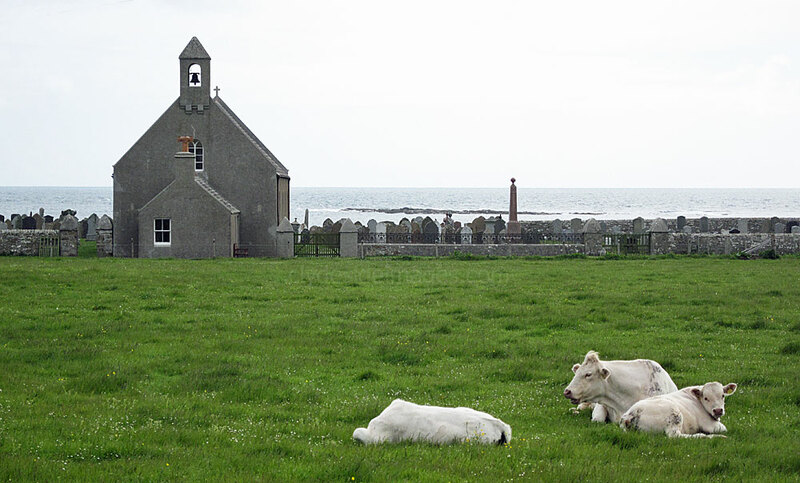 Foundations of many of the prisoners` huts can still be seen in the fields beside the chapel. 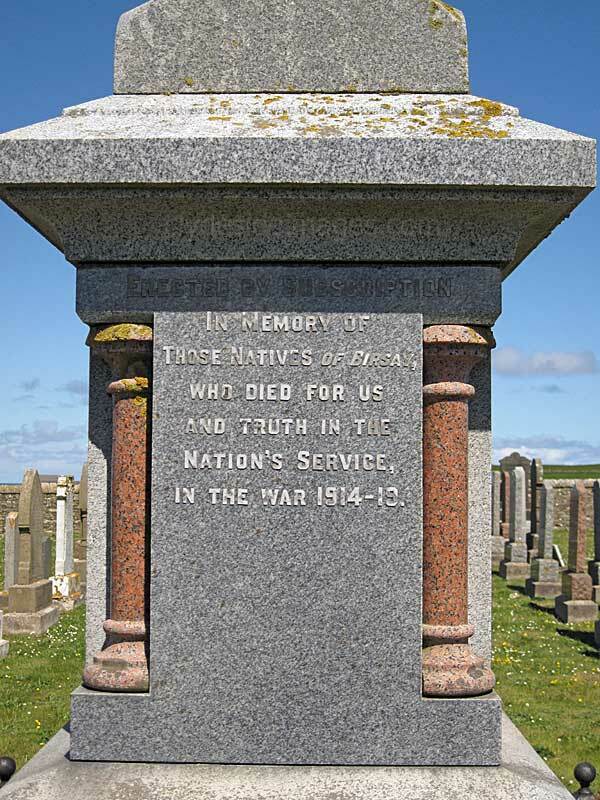 This memorial stands close to the quayside of the former Royal Navy base at Lyness on the Island of Hoy. 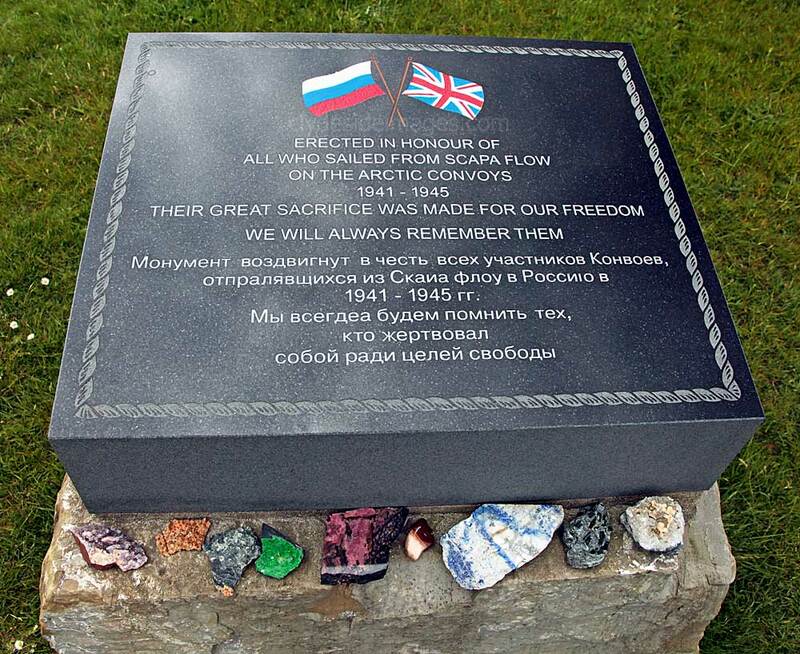 The memorial takes the form of a ship`s bow, formed by two blocks of Orkney stone, and honours the sacrifice of all who served on the Arctic convoys during the Second World War, delivering vital cargoes to northern Soviet ports such as Archangel and Murmansk, or losing their lives in the process. 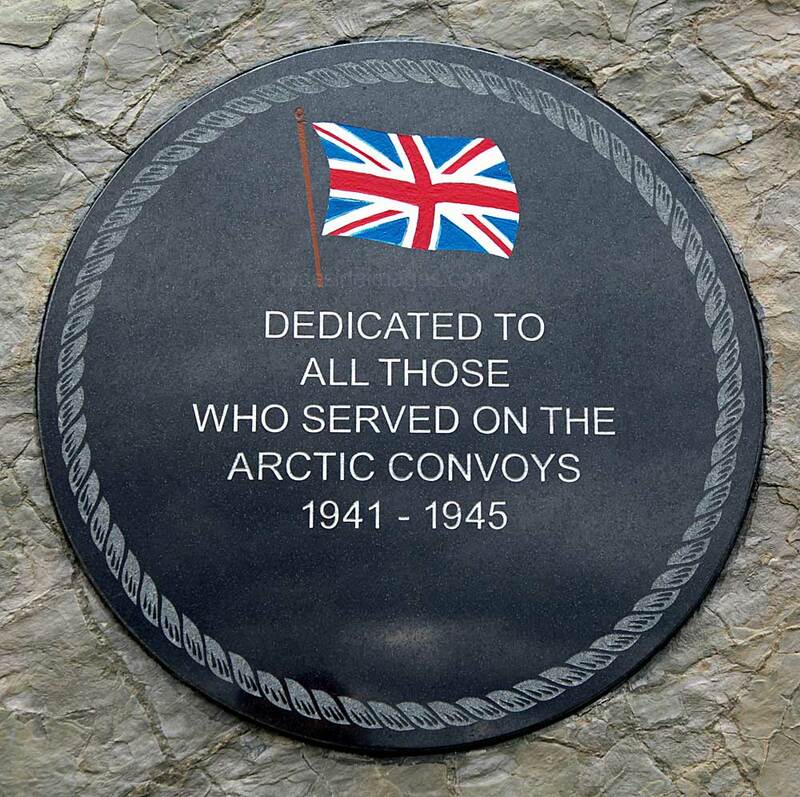 The tribute was unveiled in 2009 to coincide with the 70th anniversary of the outbreak of the Second World War. The Orkneys served as the main base for the Royal Navy`s Home Fleet and vessels from Scapa Flow sailed with unarmed or lightly armed Russia-bound merchantmen, doing their best to protect the convoys from U-Boats, Luftwaffe bombers and the constant threat of attack by the Kriegsmarine`s large surface raiders such as Scharnhorst and Tirpitz. Freezing conditions were an additional hazard that had to be endured. 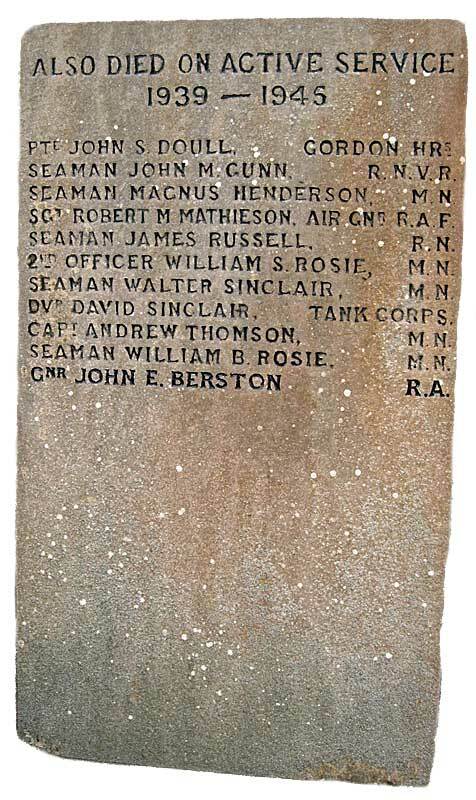 The Royal Navy were forced to relocate for a time following the sinking of the Royal Oak until anti-submarine defences around Scapa Flow were improved and many Arctic convoys formed up and sailed from Loch Ewe, the Clyde and Rosyth. 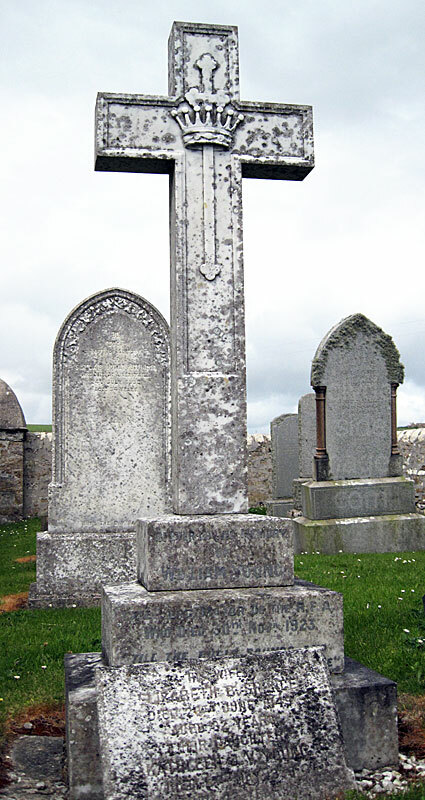 The Kirkhope Burial Ground at Osmondwall, lies near the south end of Hoy overlooking North Bay between the larger island and South Walls. Seals favour the shore at low tide here and, like much of the Orkney coastline, it`s a good area for birdwatching. 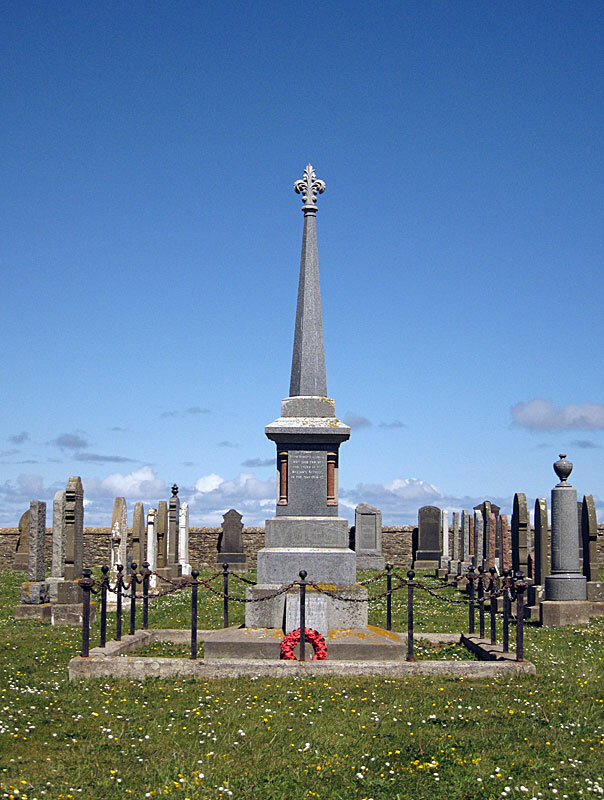 The Kirkhope Cemetery is best known for the Longhope Lifeboat Memorial which commemorates eight local volunteer RNLI crewmen who died attempting to rescue the crew of a stricken merchantman in 1969. Also contained within the cemetery are the Commonwealth War Graves Commission Cross of Sacrifice and a large number of CWGC headstones. Most of the military graves relate to naval personnel lost in the Great War. 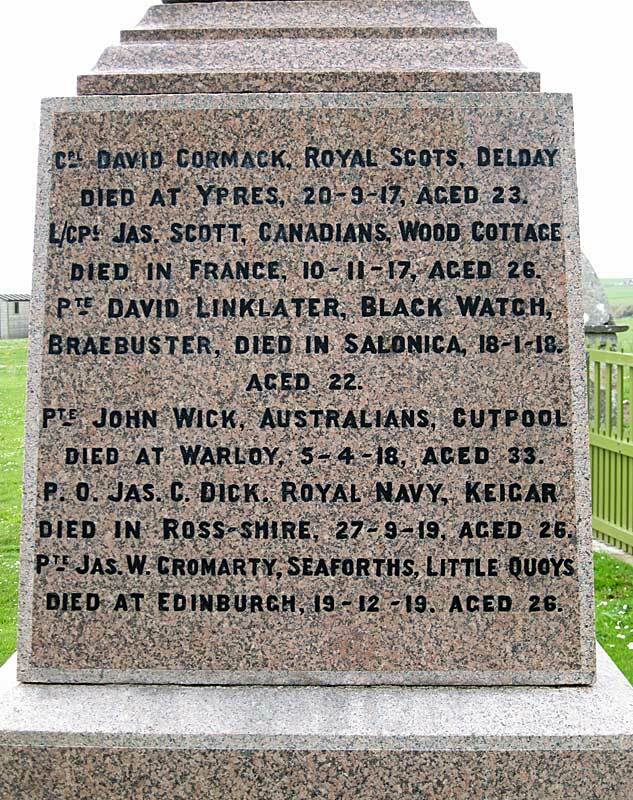 Many headstones list the ships the crewmen belonged to and include HMS Ajax, HMS Amsterdam, HMS Cyclops, HMS Defence, HMS Emperor of India, HMS Iron Duke, HMS Royalist, HMS Victory II, HMS Vivid, RFA Mercedes and several merchant ships. An individual CWGC headstone to an `Unknown Sailor of the Great War` stands outside the main door of the old chapel. This bench, decorated with artwork showing Orkney`s Viking past, lies at the top end of the cemetery. Right: Launched on 27 October 1905 as the passenger liner Indrabarah, this ship was a product of Sir James Laing & Son, Sunderland, U.K. but the Admiralty purchased the vessel as the ship was being fitted out. HMS Cyclops (F31) was finished to serve as a submarine repair and depot ship and served during the First World War with the Grand Fleet at Scapa Flow. Following the end of hostilities, `Cycle Box` as she was known in navy circles, was paid off on 1 April 1919, but recommissioned for White Sea duty at Archangel after which she returned to the UK for a refit then was placed in reserve. Between the wars HMS Cyclops served in Malta but returned to Home Waters in late 1939 to serve as the depot ship for the Royal Navy's 7th Submarine Flotilla based in Rothesay, Isle of Bute. She was scrapped in 1947. 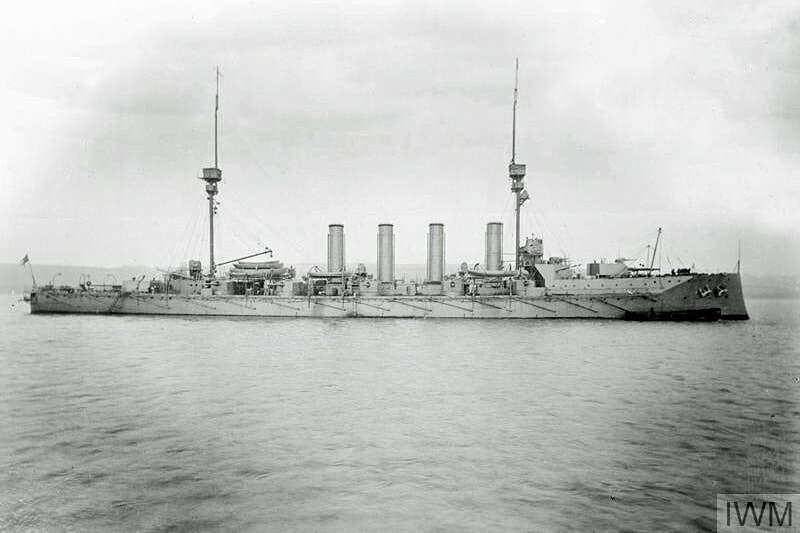 ​Below: HMS Defence was a Minotaur-class armoured cruiser and the last armoured cruiser built for the Royal Navy. When the Great War began, she was stationed in the Mediterranean and was involved in the pursuit of the German battlecruiser SMS Goeben and light cruiser SMS Breslau. The Royal Navy warship was transferred to the Grand Fleet in January 1915 and remained there for the rest of her career. She met her end on 31 May 1916 during the the Battle of Jutland, the largest naval engagement of the war, when she was sunk by enemy action. ​Defence had been escorting the main body of the Grand Fleet, when she was fired upon by one German battlecruiser and four dreadnoughts as she attempted to engage a disabled German light cruiser. truck by two salvos from the German ships, her rear magazine detonated and the fire from that explosion quickly spread to the ship's secondary magazines, which exploded in turn. There were no survivors.